Does anyone else out there have a bothersome mindset about money? Does it ring any bells when you read the following list? Always look for the cheapest thing on the menu; while husband thinks nothing of having a steak. Worry about not having enough money, or about running out of money. Buyer's remorse after a bead or fabric shopping trip. Get in a twit when the Dow drops 10 points. Get in a huge twit when the Dow drops two days in a row. Put off getting new glasses because they're so expensive. Stay in the cheapest motels when traveling. Not give money to those in need. Money issues. 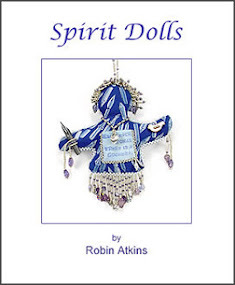 Yup, I got em... Years ago, writing poetry and doing improvisational bead embroidery, I lessened the grip of money issues quite a lot. But in recent years, as I've approached seniorhood, the worry has started to creep back into my life. My wonderful husband doesn't seem to be afflicted in this way. He's always telling me, "Go ahead... it's only money!" 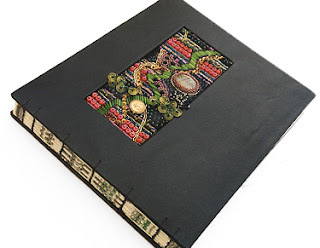 When I worked on this issue 10 years ago, I backed my bead embroidery with a $5 bill. 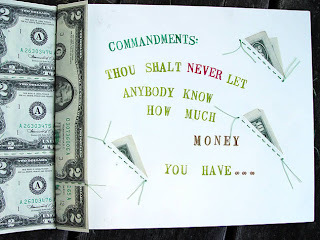 I made a book with it, and used it to list my "money commandments" (such as "Thou shalt worry about having enough money" and the two shown below). Here are a couple of pictures of this project. Ever since then, I've thought that I should have used a $100 bill! So this time I did. Below is my August BJP page. I was so nervous when I tore the bill at the start, but as the piece progressed, I started to feel pretty smug about it. Yes, it IS only money, after all. Do you realize how many beads you could buy for $100? That's not really real... You made a copy of a $100 bill! If you ever need it, you can take it off, tape it back together, and use it. How much do you think it would cost to go to a therapist and deal with my money issues? How much do you think my inner sense of well-being is worth? 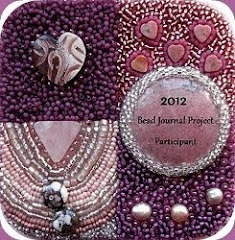 Time will tell how well this bead therapy has worked for me, but already I've made some changes that make me feel much better. The tiger is one of my two totem animals. He is here because I need his power and strength to put money worry behind me. That is truly awesome. Congratulations. And you are right, it is only money and your inner sense of well-being is absolutely worth it. Still took courage and for that I applaud you. I Love it!!! I have woeful money issues too. And I see your other totem animal on the fabric! Cool! Oh my. How difficult that must have been for you to do. Isn't it nice to know that you have that kind of strength? I've "loaned" money to others knowing I would never get it back, but I don't know if I could do that. I love your tiger and what he represents for you. Wow. That's incredible. You did a super duper tiger! (Bet you thought I was going to mention the money! 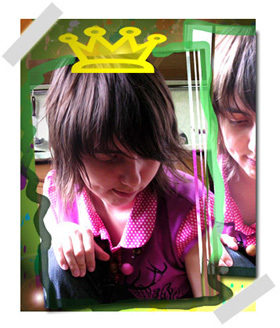 There, I did.) This is a really artistically done page! 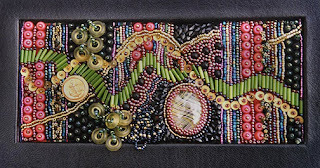 I don't know how bad your money issue really is but there is certainly no problem with your beadwork! Beautiful. Actually, I do understand a little about the money issue. I once bought a Lladro figurine which was very expensive to me. When a Japanese (I was living in Japan at the time) friend admired it I didn't give it to her and 2 days later my husband broke it! Something similar happened one more time and now I have learned that objects are not friends and it was only money (yep, that ol' money thing) that was spent; friends are worth a whole lot more. (The reason my friend admired the statue was because it was the Holy Family, she went to a missionary school as a child and Christian objects weren't sold in Japan - at least at that time so I should have seen it meant a lot to her, more than money! Life's lessons. and an awesome page to boot . . .
Oh, that tiger is eyeing me. Love all the pages you've shown here but the post is absolutely making my gut churn. Art is supposed to give you a reaction eh? The piece, the post is really making me think. Thank you for that. Blessings and examining our lives come in oh so many ways. Wow, I love it, your tiger is awesome. Oh yes, I can tick a lot of the boxes in your list. I have over come my guilt of spending on embroidery supplies by saving a given amount each month into a separate account. I earned it; I saved it, now I can spend it on whatever I want. I wondered if I could use a 100-dollar bill for a canvas, then I looked at the invoice for my latest embroidery purchase. 15 inches of white/gold silk at 5.40 dollars per inch, total 81 dollars. It’s not so different really is it, stitch on the 100-dollar bill or spend most of it on fabric. BTW, you and your fellow BJPer’s have inspired me to try my hand at bead embroidery, tentative first steps but very enjoyable ones. Thank you. You're very amazing woman! I guess you've heard that thousands of times in your life, but I feel I must say that one more time. Wow. I have a money issue. I can actually recognise myself in several of your points. One of my points was also not to be prepared to pay the price for therapy, which I have got over, so I appreciate what you're saying about that too. Your piece came as a blow in the stomach as far as I'm concerned, because it is very beautiful, and because I admire your nerve. I think you're making a very powerful statement, I can only add : congratulations ! What a fantastic page!! The tiger is very handsome. How liberated you must have felt deciding to tear the money.....congrats. At first glance, I got such an overwhelming feeling of liberation and freedom coming from your piece. Strength and bravery, too, to tear a $100 dollar bill! What a great job on your tiger. Aside from all the money issues...I am most excited by the artistic accomplishment of this piece! 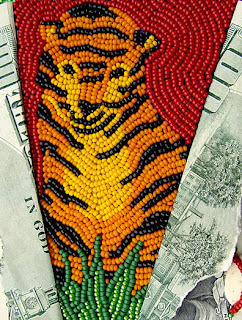 The finely and classically engraved trees and buildings juxtaposed against the tiger beads; the way the tiger breaks through the torn and folded back money, with his green growth supporting him; the beaded graffiti over the sacrosanct $100; the dangling key to it all...Robin, this is a very mature, serious, and yet playful work of art. Really impressive!!!!! Both of these are awesome works! In my family it's the husband that has the emotional attachment to money. He's taught mea bout saving and I've taught him about letting go! What an impressive and thought provoking piece. It hits home since I'm struggling with money issues for the first time in quite a while. 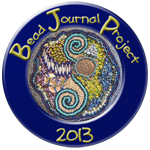 Thanks for sharing this with us and I'm thankful that I can bead, helps relieve the stress! 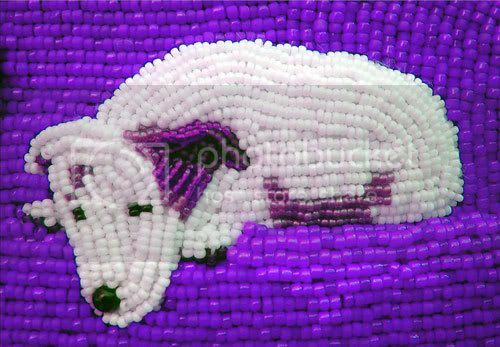 Fantastic, creates such a great reacation from the viewer, much more than a $100 bead ever could. Amazing piece! Yes, I do recognize myself from your money issues list... except for the cheap motels, since I'm the one who pulls up at the rest area and sleeps in my car! XD And I have never yet had that buyers remorse about beads or fabric. Money has been a recurring issue in my life, and I appreciate using the $100 bill for this piece. It made me realize that, whether I have money or not, I have only had a $100 bill in my hands less than 5 times in my whole life. Interesting. 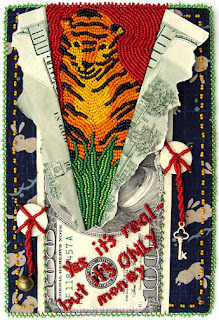 The tiger is so beautiful and peaceful there behind the money, too. I particuarly like the key and little bell, which made me think of the things that money can mean in life, even though, really, it is just a piece of paper. In the long run, I have never really regretted spending money on that more expensive something, and this piece really reminds me of that. To All ~ Thanks soooooo much for your supportive and insightful comments!!! Karen H ~ You get the prize for noticing rabbit! Freebird ~ Maybe we need to do a "Let go of the guilt" piece?! CA ~ Yay!!! 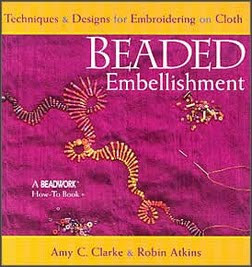 If we've inspired you to do bead embroidery, I'm a happy camper! 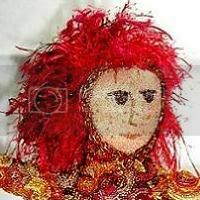 Girl of Fall ~ The "Thou shalt" comes from a poem I wrote about 10 years ago called Commandments. 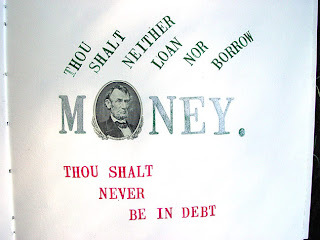 It's written in biblical style, as though these "rules" about money were given me by a "higher power," because that's how much I'm controlled by them. Does that make any sense? Helene H ~ Wow! To be compared with French poet and singer, Serge Gainsbourg... OMG... that's awesome. Thanks! Allie ~ Oh dear heart... What high praise! I don't feel I deserve it though, because it all just sort of happened. It wasn't planned to be artistic, only to serve my personal need for change. Vicki W ~ Yes, the same with us. My husband never used to save and I never used to spend. We've both moderated under the other's influence. Nice, huh! 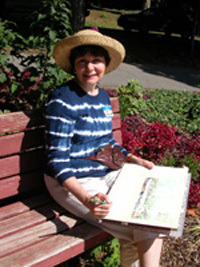 Lois B ~ Interesting that you mention the key and bell. My hope that every time I hear the sound of a bell, I will give some money away, even just a little. And, every time I have a key in my hand, it will remind me that the key to contentment is not money. 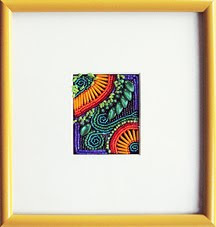 Besides, not only your well-being is much more worth than 100 Dollars, this piece is as well (with or without that torn note). This is one great page. It works for me on a lot of levels - but mainly the tiger rising organically out of the torn bill! It could not be more perfect. Roar! Robin, this was very brave of you! I love the textures and depth (and the background fabric - how could you not succeed with both totems there? 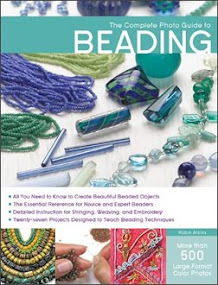 ), and you know I'm a big fan of bead therapy these days. ...she/he seems so calm and peaceful, yet strong and powerful. I admit, I love clearance...and I love to stock up on supplies when they are marked down, but that never stopped me from paying full price for materials when I need them. As far as vices go, this is pretty insignificant...because it does NOT affect my daily living and I am not in debt. I can totally relate to your post. You are brave for beading that $100! I'm a beading blogger, too, and I'd love to trade links, if you're interested. 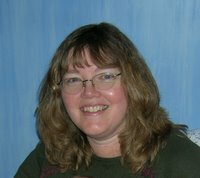 My blog is katiehacker.blogspot.com. I love this! A self-help book about money issues suggested throwing away a $20 bill--I like what you did much better! Might as well turn it into art! 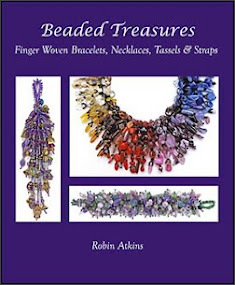 How many seed beads for $100? Let's see, I had 10 tubes @ $2.00 ($20), plus 3 @ 2.75, 2@ $6, 8 @ $3, 4 @ $3.5 (I'm at $77.50), 2 strands of $3 fire polish ($83.50) - that was one vendor (no, I didn't memorize it, but I have my receipt), and 6 tubes at Glass Garden for $24.80 - $108 is 31 tubes, plus 2 strands of fire polish. 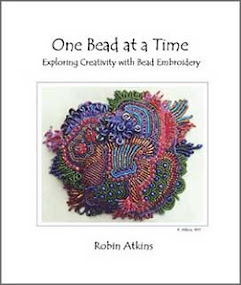 Robin, I bet your piece gave you just as much satisfaction as all the beads that I purchased on Sunday! Well done! Very nice Robin. Unique idea. 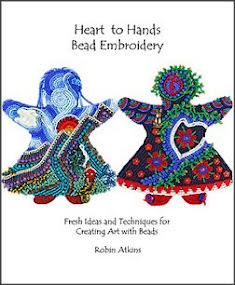 It takes a true beader to find ideas like that. I love it! You are getting ever deeper into your money thing and resolving it as it works for you! I think that is great! I'm happy and pleased for you! Holy cow what a statement! I also have money issues, but I couldn't do that! How courageous and it is, after all, only money. My friend tells me to make sure to spend all my money on my vacations. So I do, and then some. I have many of those money issues. Not sure I have the courage to use this technique for overcoming them! I think it's interesting that your tiger looks childlike (kitten-like? [innocent? guile-less?]) to me. All in all a totally fabulous piece of work. I especially like the "grafitti!" Your annonymous reader definately has some money issues. I'm sure it is also considered defacing currency to place a penny on the rail road tracks, or to use a gold coin as a pendent. But then the government hasn't ground to a halt because the citizens of the world have horded coins and currrency in jars, coffee cans and safe deposit boxes either. Some how I don't think your BJP is going to bring the country to it's knees. It's a great piece and it's your money!!! Ahhh, about money....and your beautiful Tiger. The first thing that came to mind was the old song 'It's Only a paper Tiger'. Sort of how money can make us feel strapped and stressed, but in reality, we are in charge of how it makes us feel..it's only a paper tiger, indeed. Thanks for sharing your Heart with this. Absolutely amazing! What a breakthrough! AND the tiger is so beautiful! What an inspiring post. I just wrote about money in my last post too, and NO buy day. Your work is exquisite. Glad I stopped by. I am always amazed & delighted when I read any of your posts, you are so inspiring & creative....thanks for being you & who you are! !